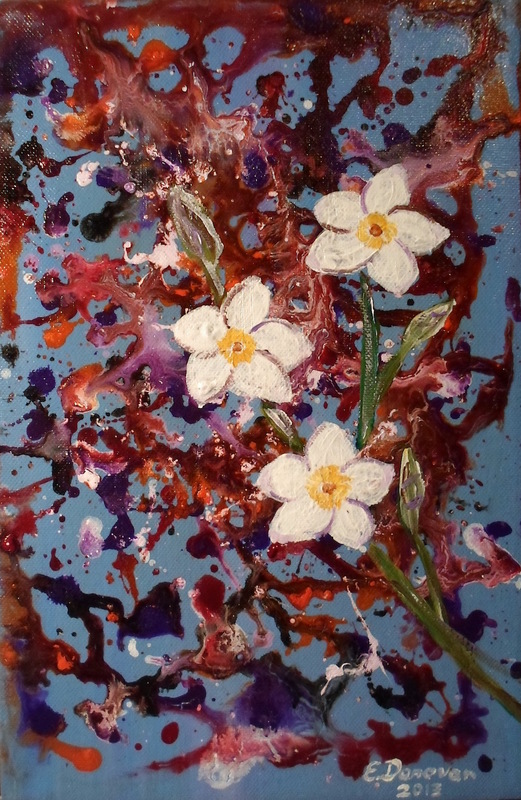 Plumeria Splash, acrylic on canvas, 2012. SOLD. Click to enlarge. Plumerias are wonderfully delicate tropical flowers and I’m sure a lot of artists painted them. I too got attracted by them and wanted to paint these lovely blossoms. However, I decided to step away from painting plumerias in the traditional way and decided to experiment with the background. First, I painted the background light greyish-blue and let it dry completely, Then I fixed some boards against the sides of the stretched canvas and then poured some acrylic varnish on top of the background. Before the varnish dried, I added random splashes of acrylic paint diluted with water and let it all dry. And lastly I painted the plumerias over that colourful mixture. This contemporary abstract flower painting has been sold to a private collection in Moscow, Russia. You can purchases all types of prints (art prints, canvas prints, metal prints, etc.) from Fine Art America. If you are interested in commissioning a similar painting, please contact me.